Every dad should want to have a positive influence on his children. As men, we want to work efficiently and show real results. 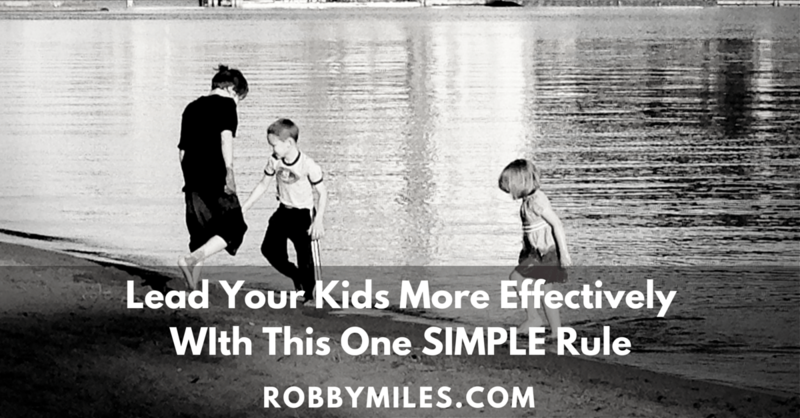 Sometimes this can be incredibly difficult when it comes to working with kids. Follow this one simple rule and you’ll see great results. Analyze your project for non-negotiable deadlines. Create a timeline using the guidelines below. Divide each task/project into thirds. The first third is for developing your plan and communicating your goal/mission to your kids. Share your task & purpose. Communicate your “End State”. Give your kids a clear understanding of your expectations. The second two-thirds is for your kids to ask questions, make mistakes, and take action. This is their chance to creatively solve problems and prove what they are capable of. They can do way more than you think, so give them a chance! This rule allows you to do your job as a leader: supervise. You can see that this system is pretty simple. Now, let’s take a quick look at three of the benefits. Who likes having their boss hover over them micromanaging every step? You guessed it. No one. Not even your kids. Your kids have an opportunity to learn. They’ve got the chance to try something new or unique. Let them bring their skill-set to the table and share their talents. The 1/3-2/3 rule allows you to set the limits for your projects. You give a basic outline and timeline, then let your people get to work. Your kids will cherish having the freedom to work on each project in the ways they know best. You will have the freedom to supervise and really focus your energy on the one or two elements (or people) that need your attention most. Throughout my time in leadership, I’ve been impressed with the results my teams achieve when I give them a task, purpose, and end state in the first third of a project. If it worked for the Allies in WWII, then I’d venture to say it can work for your family.